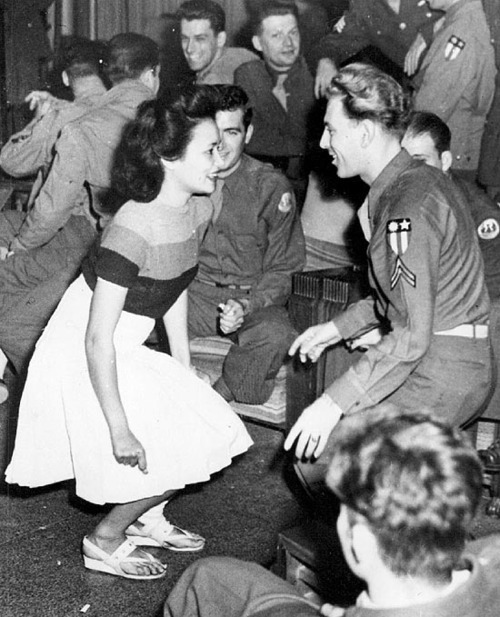 There’s this wonderful old World War Two vet I know, well into his nineties, who I see at clubs and shows all over the place, always dancing. What a nut. I’ve seen him dancing to swing, country, blues, salsa, funk, jazz, western swing and rock. Even reggae. Always has a babe for a partner. Loves to dance, he says. Started dancing to the swing bands. Jitterbugging. All hell was breaking loose over in Europe but he was busy dancing. He was a kid. That’s what you did then, danced. Then came Pearl Harbor and his draft notice. Went through the war without a scratch, somehow, though his unit was mauled a couple times. Some of those Nazis, he said, were fanatics and would fight to the death. It’d be hopeless and they’d keep firing. Friends kept getting killed. Mines going off. Snipers, machine guns, 88’s. He was nearly blown to pieces more than once. The Battle of the Bulge was the worse, he said. They were all freezing cold, and a rifle isn’t particularly useful against a Tiger tank. Thought he’d bought it more than once. On top of all that the Nazis were massacring prisoners. If you were Jewish the last thing you wanted was to surrender to one of those SS bastards. His company had been cut off, and it looked bad, but somehow they managed to rejoin the rest of the battalion. Left a lot of friends there, he said. He saw one blown to smithereens. Should have been him but he had slipped out of the foxhole for chow or to take a leak or something–just before the mortar bullseyed his buddy. Nothing left. Somebody was looking out for you, I said. He laughed. No, just luck. That’s all it ever was, luck. Later, in Germany, all the towns were gone, flattened. The RAF had gotten their revenge. The people were giving up, meekly surrendering. But there were fanatics everywhere. Hitler Youth who kept fighting no matter what. You’d see them later, just kids in baggy grown up uniforms, dead. He kept losing buddies right to the bitter end. Still, he made it and now a zillion years later he dances every chance he gets. A lady comes by and taps him on the shoulder, and they spin slowly, lightly, across the floor. This entry was posted in Story telling and tagged AARP, Battle of the Bulge, dancing, Jewish, Nazis, old man, retired, Second World War, senior citizen, the Greatest Generation, Tiger tank, veteran, World War 2, WW2. Bookmark the permalink.